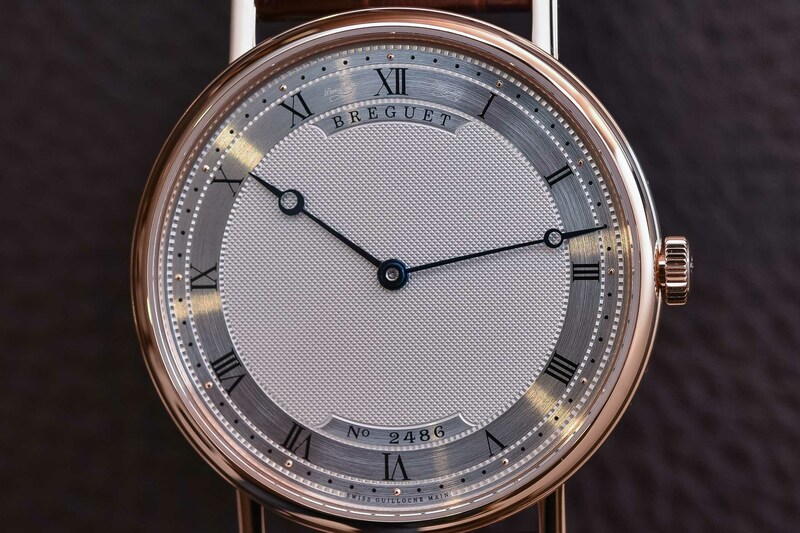 One of the simplest Breguet Classique watches is a demonstration of the brand's "savoir-faire". Creating a two-hand ultra-thin watch is, believe it or not, one of the most complex exercises for a watch designer. Because of the extreme simplicity of such pieces, it is easy to end up with the most boring watch possible – and how do you differentiate yourself when you simply have nothing to express…? 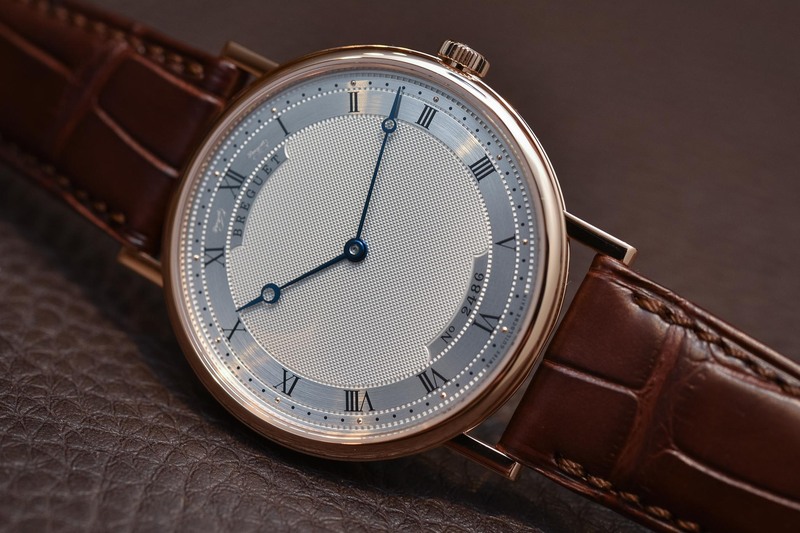 This is where the Breguet Classique Extra-Plate 5157 (and its 2018 pink gold version) is brilliant. It manages to be extremely pure, clean and simple and at the same time remains a quintessentially Breguet product. With ultra-thin, time-only watches, what sounds initially like an advantage is actually a disadvantage. 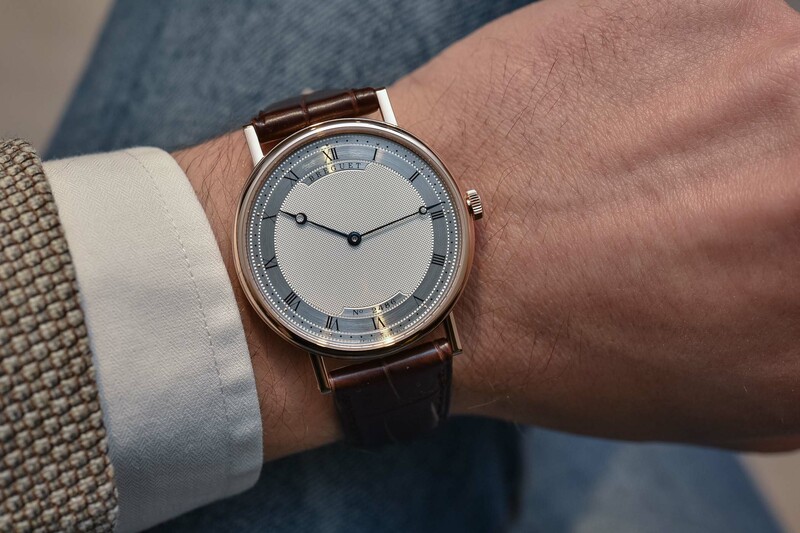 Don’t think for a second that creating a pleasant ultra-thin, time-only watch with its own personality is easy. In fact, it can be much more complex than a watch with complications – a topic we discussed here with another brand – as there is a very low margin to express the DNA of the brand: a small case, two hands and a dial… That’s all you have. And since this species of watch needs to be elegant, timeless and discreet, the situation gets even trickier. 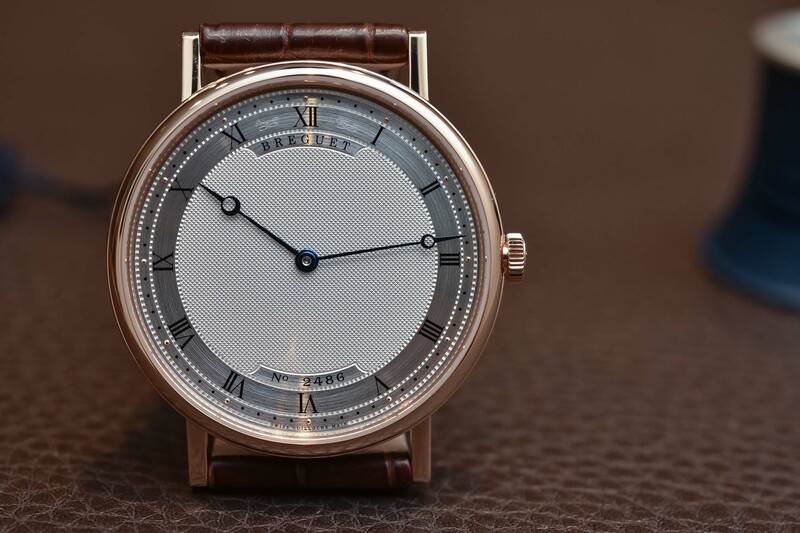 With the Breguet Classique Extra-Plate 5157, we might have found a solid case study to prove the opposite. This watch doesn’t have to pack complications and design tricks to be immediately recognisable as being part of the Breguet family. Consistency in the design and a well-dosed use of tradition isn’t just a statement of conservatism. In the case of this Ref. 5157, it becomes a way to express the brand’s DNA in a watch that is absolutely simple, but easily identifiable. The Breguet Classique Extra-Plate 5157 is all about purity: a 38mm case, a slim profile, a 2-hand display and voila! All of these features can also be found in a Piaget Altiplano, a Patek Philippe Calatrava or a Vacheron Constantin Patrimony. 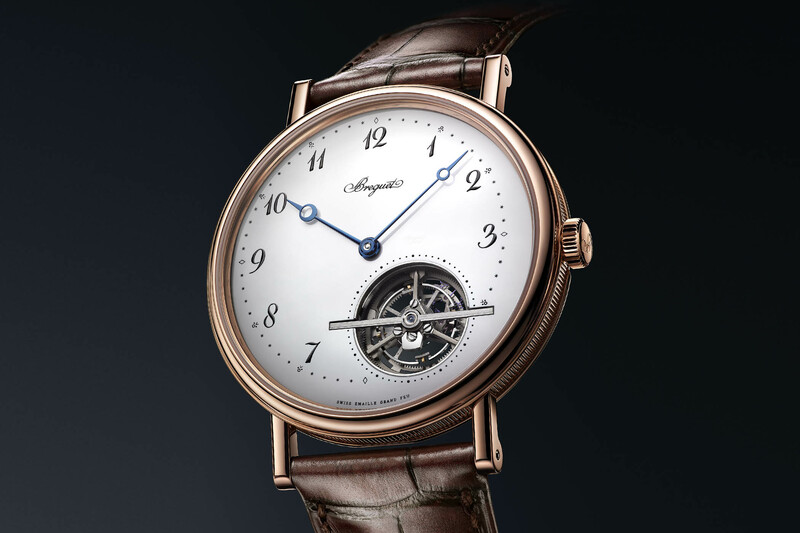 Yet, the Breguet stands apart from the rest of the crowd of ultra-thin 2-handers. How is that possible? This is where Breguet’s “unmistakable signs” take on such an important role. The fluted case – fine grooves enhanced with double beading found on the caseband. This fluting was used already by the founder, A.L. 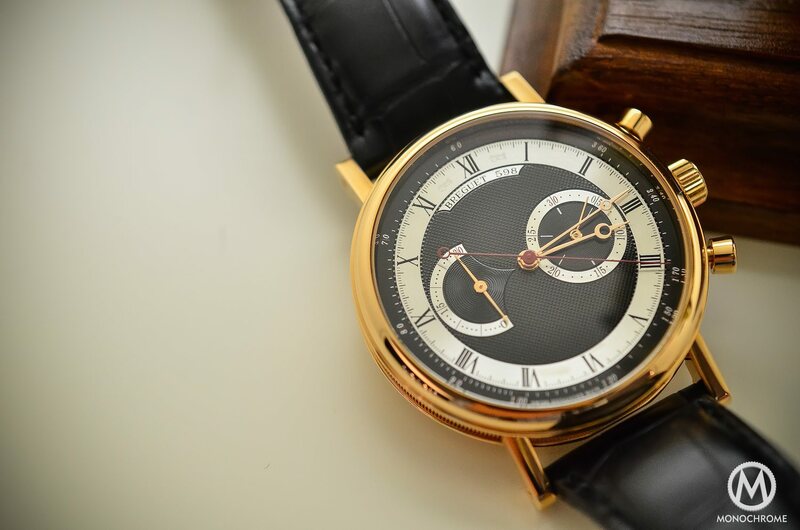 Breguet, on some of his earliest creations and has since become a cornerstone of the brand’s design. The fluted pattern is cold-rolled into the case band then finished by hand on a mechanical workpiece-holder. The welded lugs – A salient feature of Breguet watches is the specific lugs. 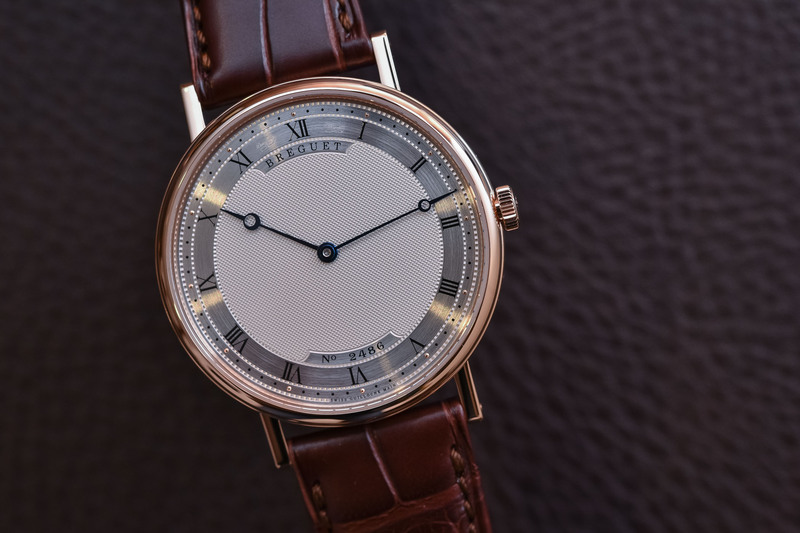 While many brands use lugs that are machined at the same time as the case (being an integral part of it, mechanically and design-wise), Breguet relies on lugs that are later welded onto the caseband and with a thin, straight profile. Also, screw-pins, rather than the more usual sprung bars, hold the strap between the horns. The Breguet hands – These hands need no introduction anymore. Widely used by other manufactures, they still need to be credited to the Breguet Maison. These hollow, eccentric “moon” tip watch hands have been used by the brand for over two centuries now (designed around 1783). The engine-turned “guilloché” dials – by far the most important “unmistakable sign” of a Breguet watch, and the easiest to spot. 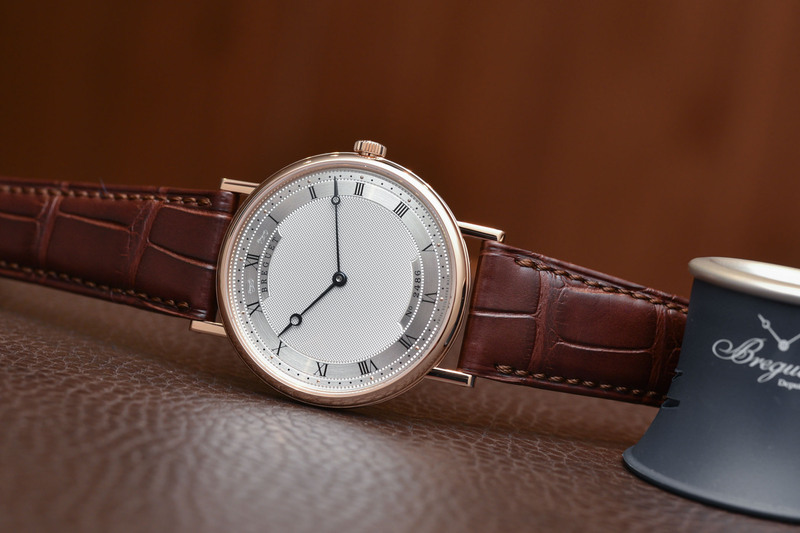 All Breguet dials, from a grande complication or this simple 2-hander Ref. 5157, are always manufactured with great attention to detail. Smooth to start with, the solid gold dial plate is first worked with a hand-graver to outline and hollow out the areas of the dial reserved for indications. Engine-turning or guillochage is then applied by lathes designed and built over a century ago, which engrave intricate patterns – in the case of the 5157, a fine “clous de Paris” pattern in the centre, “pavé de Paris” cobbling to separate the indication and circular brushed surfaces for the hour ring. The secret signature – Breguet was probably one of the first brands to face counterfeiters. For this reason, in 1795, A.L. Breguet came up with the idea of secretly signing the dials of his watches. Etched into the dial, the signature was all but invisible unless the dial was examined in oblique light – it is slightly easier to see nowadays. Back to the Breguet Classique Extra-Plate 5157, which is now available in pink gold, in addition to the existing white gold and yellow gold versions. This watch is one of the simplest (and consequently one of the most accessible) watches of the Classique collection. However, as we’ve seen, it still relies on the same design codes (and some are costly) as the more complex watches. This is the main reason why, compared to the competition (VC, PP, ALS), it stands apart and has its own personality – a surprising mix of elegance, tradition and complexity. 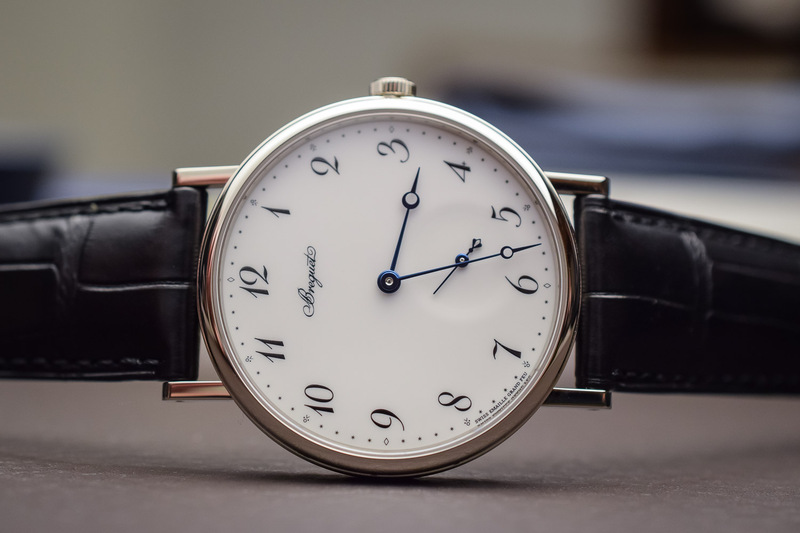 The case of this 5157 is 38mm in diameter – yet it wears slightly larger due to the long welded lugs – and is only 5.45mm in height, even though the watch is automatic. If you think about it, it is still one of the thinnest automatic watches on the market – behind the new Piaget or Bvlgari watches, of course. The addition of a pink gold case in the collection is a wise decision, offering a warmer tone compared to the white gold version, but at the same time a more modern look than the yellow gold edition. On the wrist, even though it is quite small, slim and devoid of any complications, it has a true presence and elegance. The dial is, as usual, more striking on these macro shots than it is once worn. However, the contrasting surfaces of the dial play with the light resulting in a lively watch. Which goes to prove that a 2-hander can be attractive and distinctive. Also, compared to the Ref. 7147, which shares the same base movement (but with small seconds), the case is 2mm smaller, resulting in a more balanced watch. 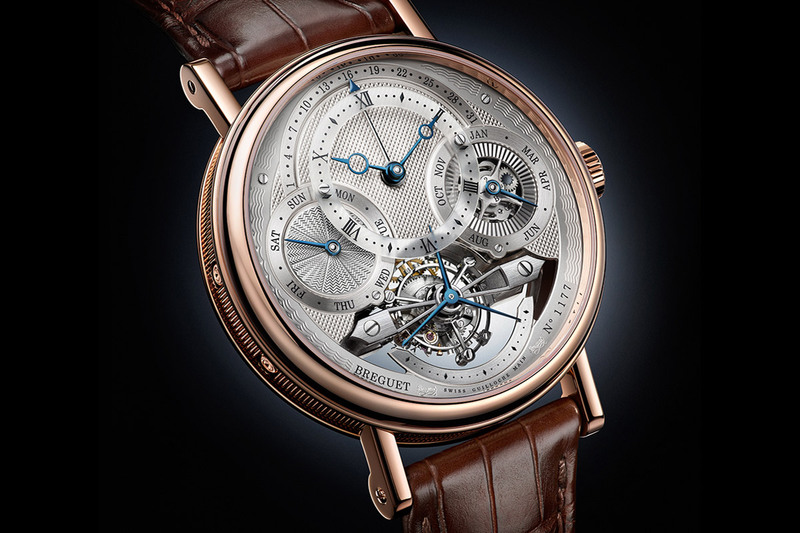 Powering the Breguet Classique Extra-Plate 5157 is the automatic calibre 502.3. Despite having a classic rotor mounted on top of the movement – and not a peripheral or a micro-rotor – it measures only 2.4mm in height. The movement doesn’t feature novel architecture but has been updated with a lever escapement with silicon horns and a silicon balance spring. It has a 3Hz frequency and a 45h power reserve. The view through the sapphire caseback is pleasant, with a slightly off-centred rotor in solid gold, with a guilloché pattern, polished bevelled angles and thin Geneva stripes. The Breguet Classique Extra-Plate 5157 is one of those rare ultra-thin, time-only watches with a unique and desirable personality. Even though it is very simple on the mechanical and display front, it catches your attention. It retails for EUR 18,300. 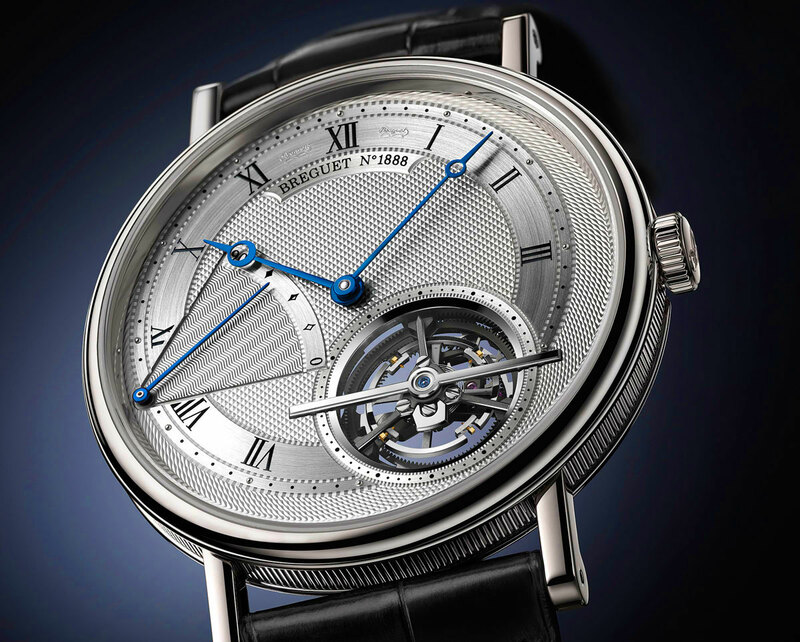 More details on breguet.com. Beautiful, like most Breguets, but just a little too simple for my eyes – I went for the 7147bb, with the added spice of the asymmetrically placed seconds sub-dial, though the 2-hander was a close second. Beautiful piece of craftsmanship but that off centre movement annoys me . I have checked several different watches in this series and always felt their straight lugs are too prominent. Ultra thin with no side photo….huh? 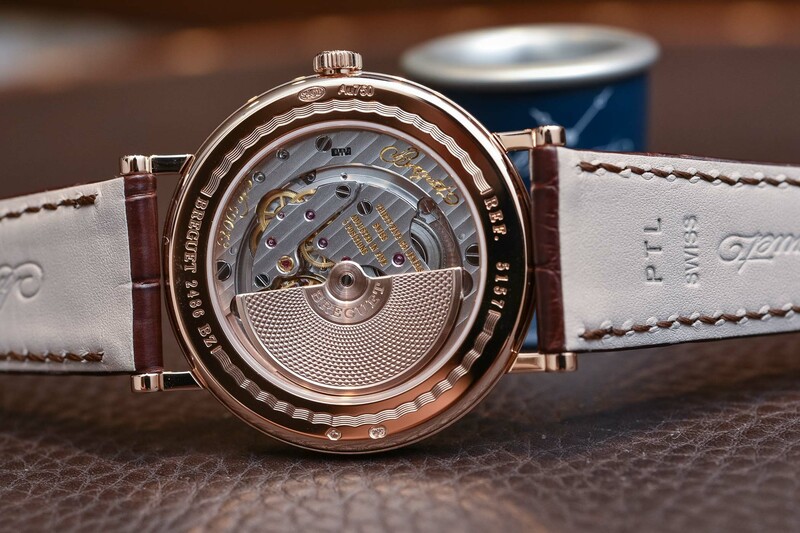 Pure Breguet indeed, this brings all that is good about the brand. I agree, the off axis rotor feels a bit off axis, and I would have liked a back off photo to see if the calibre itself is set asymetrically. I don’t mind the lugs as they seem quite well integrated to the aesthetic here of understated precision. Bought this in pink gold a few weeks back. Can see why some would find it too simple, and if I didn’t have other more complicated watches, I doubt I’d have chosen it over a dress watch with at least a seconds hand, or at most a date aperture, but I didn’t need those things for the space this watch needed to fill. I had the choice down to the Breguet vs the slightly cheaper A Lange & Sohne Saxonia Thin 37mm. Would have been happy with the Lange (of course) but the dial detail and the fascinating and strange Frederic Piguet 71 movement of the Breguet won me over. You should definitely edit a side-on photo into in there, Brice. Sounds like an idea, Gil. Let’s see what we can organise, in terms of getting those watches together in front of the camera. Not that special a collection, really, Frank. A 1960s Rotary centre seconds gold dress watch, a Glashutte Original Seventies Panorama Date, an Omega Aqua Terra Annual Calendar that’s currently being serviced before I try to trade it in for a Grand Seiko Spring Drive, and the Breguet 5157. If you would like me to send you some side-on pics of my Breguet that you could touch-up and use, just drop me an email. Or did you mean get the ALS Saxonia Thin and the Breguet 5157 together (which would be good), and I totally misunderstood? Eek. To what does “extra plate” refer? I think ‘plate’ can be used in French to mean ‘flat’, as in flat shoes – des chaussures plates. Presumably has something to do with the Old French etymology of the word ‘Plate’ being a thin piece of metal. Also presumably preferrable to the french word for ‘thin’, which is ‘mince’. (French-speaking Brice here) “Plate” indeed means “thin” or “flat”. This “extra-plate” name is the French version of “extra-flat” or “extra-thin” used by other brands to describe their thinnest watches.